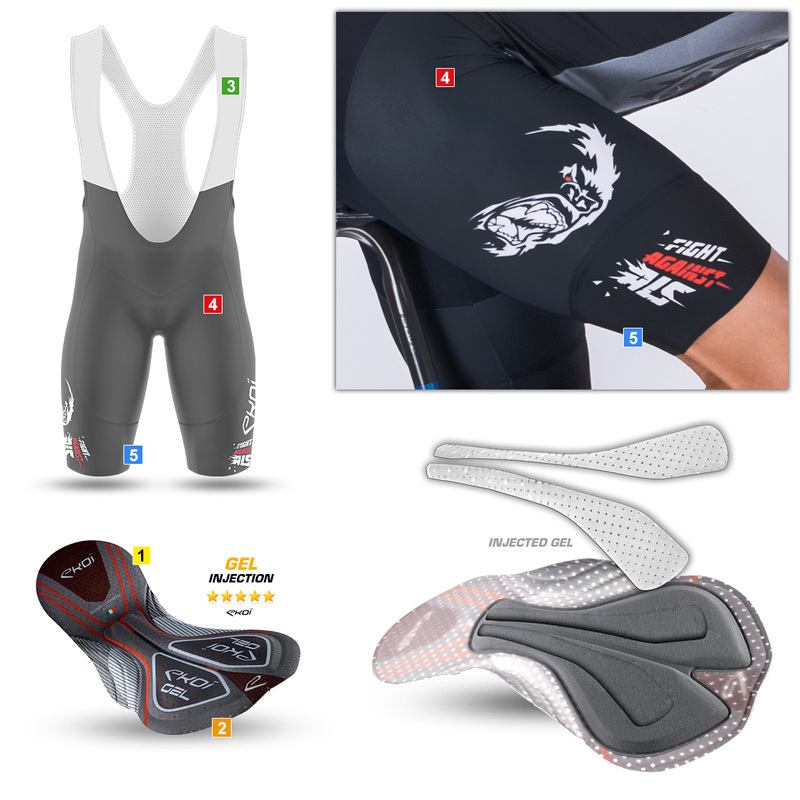 Purchase a GREIPEL THE GORILLA FIGHT ALS BIB SHORT WITH GEL PAD and you will feel a whole lot better, not just on your bike, but in life. Why ? Because you will have contributed to invaluable research into Charcot's Disease! The research into Charcot's Disease or ALS needs all our support to advance. André Greipel whose nickname is the Rostock gorilla lost his mother to this disease and so it represents for him, apart from the terrible loss, a fight to better understand this disease to find a cure. EKOI supports André in his action and we call on you to participate too. Made from 250g lycra with features of softness, comfort and durability. Finished with our INJECTED GEL PAD (for saddle-sensitive or endurance riders, or simply for stage races) our INJECTED GEL PAD is one of the best currently available on the market. New concept of medical-grade GEL INJECTION (an EKOI exclusivity) in the strategic area of the sit bones. - Pad using carbon thread to effectively and rapidly disperse moisture across the whole ad surface to leave your skin throughout your ride. - 2 densities (90 & 110mm) of polyurethane for an uncomparable comfort in the perineu and sit bones area. Pad, lycra and elasticated thigh bands made in Italy. - Do not spin dry. - And do not iron. EKOI SUPPORTS ANDRE GREIPEL IN HIS SUPPORT OF RESEARCH INTO CHARCOT’S DISEASE, A MOTOR NEURONE DISEASE ALSO KNOWN AS ALS. For every "FIGHT AGAINST ALS" jersey & bib short bundle order EKOI will donate £9 to the Foundation DZNE and £4 for every "FIGHT AGAINST ALS" jersey or bib short order.